I have a great book to share today! Electricity ripped through the air. A lightning flash lit up the room. Thunder rocked the house. Jimmy’s hand jumped, and a rainbow of colored pencils went tumbling to the floor. Outside, the rain began trickling off the roof and plinking into the metal gutter. Drops bounced onto the windowsill. A breeze rippled the glass chimes on the porch. 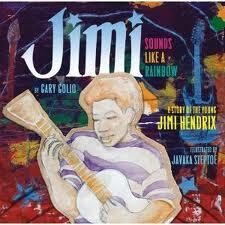 Brief Synopsis: Jimmy Hendrix (before he was Jimi :)) grew up in a boarding house in Seattle with his father. In everything around him, Jimmy heard music – children’s laughter sounded like a squealing clarinet, a truck backfiring sounded like a bass drum, a rake on the sidewalk sounded like a snare. “With every sound, a color glowed in Jimmy’s mind.” He wanted to reproduce the things he heard and saw as music – to paint with sound – even though he owned nothing musical but a one-string ukelele and his voice. He heard and saw the world differently from everyone else, and he wanted to color the world with his music. Links To Resources: the back of the book has a list of resources about substance abuse (really only appropriate for older readers) and a fascinating illustrator’s note about how the illustrations for the book were researched and created which everyone can enjoy. There is also a bibliography and a list of selected discography, CDs, videos, and DVDs. Again, much of this would be appropriate only for older readers than the usual picture book audience. Younger readers could try drawing what they think the sound of a song or piece of music looks like, or how it makes them feel. You could discuss what color a tuba, a flute, or a guitar (or any other instrument) sounds like to you. Why? What instrument or group of instruments would be a good choice to represent bird song? Traffic? Water? (or anything else you’d like to try :)) Why? Why I Like This Book: To be honest, I picked up this book because I was wondering how the author would manage to turn the Jimi Hendrix experience into a children’s picture book 🙂 The answer? Very well indeed! He focused on Jimmy’s early years, his creativity and passion, how his humble beginnings didn’t stop him from pursuing his dreams. The story is very inspiring. The language is lyrical and musical, conveying beautifully the way Jimmy saw and heard the world. “Notes spun from the strings, flickering in the air like fireflies.” And the art is the perfect match for this story – wild and kaleidoscopic and colorful – the visual representation of Jimmy’s difference and creativity, and with young Jimmy very much in the forefront of every illustration. The book ends with the lines: “Dressed in the colors of the rainbow, he played for audiences far and wide, joining fiery sounds with tender feelings and painting the world with his songs.” It does not address his drug addictions or his tragic end, but the back matter of the book does. So while the story is appropriate for younger readers, much of the back matter is really only suitable for an older audience, but for more mature readers, it’s good that it’s there. The illustrator’s notes are fascinating for everyone. The combined text and art make this book a terrific read! Would You Read It Wednesday #71 – Civil (MG Fantasy/Adventure) AND A Huge Announcement! Wow. This sounds like a wonderful book. I didn't know about his drug part of his life. My mom explained it to me. That's sad. 😦 My dad loves Henrix's music. I would've wondered the same thing? “How would an author turn the Jimi Hendrix experience into a children's picture book?” For that reason, I may have passed it up thinking it couldn't be done very well. Sounds like I would've missed out on a really great book with a perfect ending. I'll have to check it out! Susanna, this sounds like a great nonfiction book. I will have to check it out for my class. We have to read 5 nonfiction books for kids a week. Thanks so much for picking this important book up even though you had your doubts, Susanna. I am so glad the author was able to write about young Jimi and leave his overdose out of the book. This is a book I am definitely going to look for bc as you know I saw him preform at Woodstock NY and saw how he turned music into colors and art. This one's too old for my kiddo, but as a writer this sounds fascinating how the author handled this subject in the story and the back matter. Thanks for pointing this one out. Good luck! I just love the text you have shared with us, this is awesome writing. I like the challenge of making someone like Hendrix' life appropriate for young kids. Still can’t post on your blog, but I had to let you know that Jimi Hendrix book looks so cool, I might have to check it out even if we don’t get to add a new child to the family any time soon! I love his music, and think it’s great that this children’s book opens him up to a whole new generation. I agree! And the text and art together are such a great representation! Your pick today looks cool! I am really interested in how it's written. He did a GREAT job! The writing is very suggestive of Jimi Hendrix, and the focus really on his creativity and what a unique person he was – very inspiring without going into the darker bits. But definitley a book for slightly older readers. Those are exactly the reasons I was drawn to this book, Joanna. It's really worth reading! Yes, Enzo's got a ways to go before he's ready for this one 🙂 But you're exactly right – as a writer it's a great book to read to see how to handle a difficult topic and make a person accessible to younger audiences. Hope your interview goes well! wow, I am super-impressed that the author was able to do this. I am actually researching picture book biographies right now, as I have one I'd like to write but have no idea how to approach it. So thanks for a great resource! I loved your “Why I liked this book.” It sounds like the author did an incredible job! I love when someone takes a subject that doesn't seem like it'd work, and then makes it work so well. Non-fiction, music, art – definitely have to find this one! thanks for reviewing this, Susanna. I love biography picture books! I've never seen one on Jimi Hendrix before. thanks for telling us about it. You're welcome, Janet! It's definitely worth the read! And I'm guessing the reason you've never seen one on Jimi before is because he's a tough topic to handle gracefully in PBs, but Gary Golio has done it masterfully! You're welcome, Patricia! I hope you find it and enjoy it – it's so well done! I know, it's very impressive, isn't it? Really, not just anyone could have pulled off a picture book about Jimi Hendrix! Absolutely loved your selection Susanna. I always enjoy hearing stories about how musicians hear, write and compose music. Jimi was gifted at a very young age, if all the sounds he heard were music in his head. Reminds me of the movie “August Rush.” This is one I want to read! Great choice today. This sounds like a great story, Susanna! I, too, would have picked this up wondering how in the world the author would pull it off. Awesome choice! I never would have imagined a kid's book about Jimi Hendrix. I'm going to look for it 'cause, as we all know, it's important for kids to learn about the strength and determination that goes into fulfilling your dreams. I wouldn't have either, Barbara! That's half the reason I picked the book up in the first place! But he really did a good job with it, I think. And though the text, in my opinion, is a little above the average 5 or 6 year old, the story is well written and certainly appropriate for young audiences. It's a great lesson in choosing how to portray something so that you're telling the truth but not telling things that are inappropriate for the age group! Thanks, Pat, I'm glad you like it! This is one of those books that is well written but also the art complements it so perfectly that it feel just right. This is a good one! I forgot what class? Laura Salas's? Writing non-fiction? The book is very well done, Erik, because it focuses on the positive aspects of Jimi Hendrix's talent and creativity. It's very inspiring. And then the back matter tells about what happened to him, but you don't have to read that part if you're not ready for it. It is very sad. My husband and son both love Jimi Hendrix's music! Anastasia Suen's Young Nonfiction workshop. I will have to acquire this book for the music loving fellows in my life. This looks like a very interesting story. I think I might like to check it out. Wow, I wonder what Jimi Hendrix would think of having a picture book.